Due to the very nature of how depilatory creams work, they all contain strong chemicals which can cause irritation, especially for those with sensitive skin. When choosing a cream for your sensitive bikini area, it can be difficult to decide which to choose, and ultimately boils down to personal preference and which works best for you. We have found a few that we believe provide effective hair removal for this intimate area for a reasonable outlay. Veet, one of the best known and respected Brands in the sector, feature a large range of popular hair removal products. This​ gel cream is designed for sensitive skin and can be used on the bikini line, as well as legs, arms and underarms. We found it to be easy to use, and it worked well, in just 5 minutes. ​It comes in a convenient pump dispenser bottle and is complete with a spatula for even application and scraping the product off after use. Avon's bikini line hair removal cream is specially formulated to be fragrance - free, for sensitive skin. 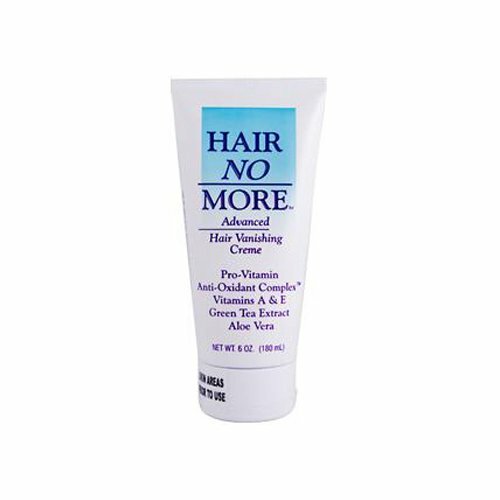 Removes hair pretty quickly - anything from 2 1/2 minutes up to 8 minutes absolute maximum. What you get for your money, though, is a small tube of depilatory cream - probably only sufficient for 3 or 4 uses. Given the retail price of around $7.50, it does not represent as good value for money as the Veet sensitive formula, however if it works for you?? Ingredients include soothing Aloe and Meadowfoam oil, to leave skin soft and moisturized after use. 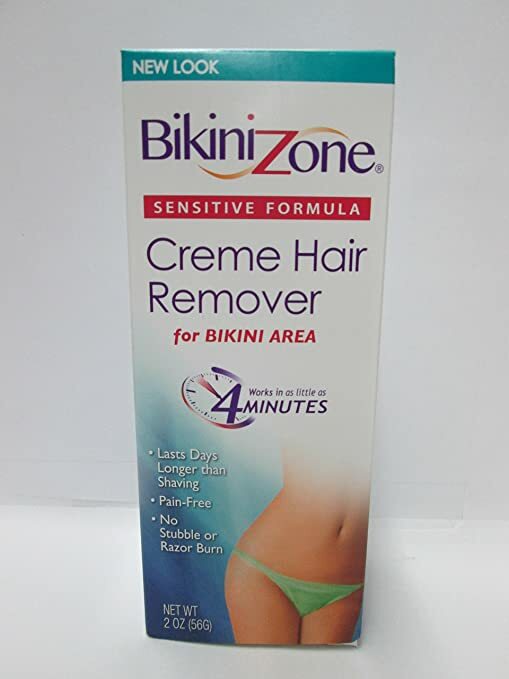 Bikini Zone is another depilatory specially formulated for sensitive skin. ​Although it apparently has a "fresh, cucumber and melon scent" I can't say that I found it particularly great. That said, the product works well and is quick to use, from just 4 minutes, with the absolute maximum recommended time being 10 minutes. Odour - Not as good as promised! 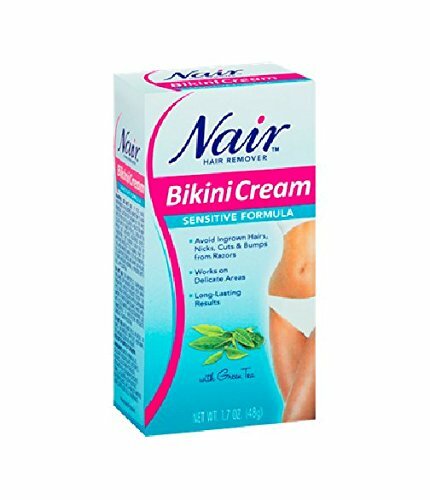 Nair's bikini cream with green tea is specifically for the bikini line for those with sensitive skin - and is also perfect for that delicate underarm area too. It comes in a small, 1.7 oz tube​ which retails at around $6, so more expensive than some for such a small amount. ​Although the odour is not perhaps as pleasing as advertised, it certainly was not overpowering and better than some of the others we have tried. Another Veet product, we have chosen this because it has the added convenience of being able to shower whilst using. It is suitable for use on sensitive skin and bikini line, as well as the legs, arms and underarm areas. The generous size of 10.1 fl oz (300 ml) provides many applications for bikini line and is available at around $13, so better value for money than the smaller tubes. Much as with the pump version, the odour is not the best and results were not quite as quick. Nevertheless, it was effective within the 5 - 10 minutes recommended, and if you prefer an in-shower depilatory cream, this is well worth a try. This product consists of a 2 oz (50g) tube of hair removal cream and a 0.5 oz (14g) tube of post-depilation calming balm. The odour of the cream is not particularly pleasant, but the calming balm is a great addition, leaving the skin soothed and moisturized. Currently retailing at $6.26, this product represents reasonably good value for money, given the addition of the post-treatment balm. 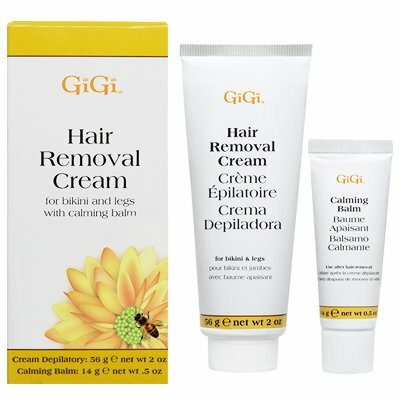 Gigi hair removal cream for bikini and legs works in 5 - 8 minutes, and we found it to be pretty efficient, and there should be enough for 2 - 3 treatments of just bikini line. Retailing at around $28 for a 6oz tube, this is the most expensive of the hair removal options reviewed. ​Can be used for bikini line, as well as arms, legs, back and chest. ​Works in 3 - 10 minutes - we found 5 minutes to be effective.